Looking for a scenic drive in the Alberta Rocky Mountains? This Icefields Parkway itinerary will get you the best photo ops at the most stunning spots between Lake Louise and Jasper. 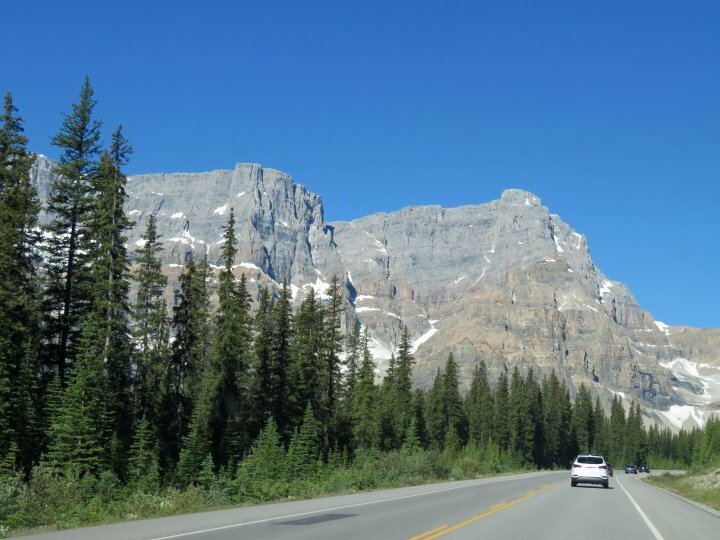 This road trip is rated as one of the Top 10 most scenic drives in the world and it takes you through the top 2 most visited national parks in Canada, Banff National Park and Jasper National Park. The 230 km (143 miles) Icefields Parkway (Hwy 93) in Alberta, Canada linking Lake Louise (near Banff) to Jasper is one of the most beautiful road trips in Canada, and the whole wide world. Without making any stops the drive takes around 3 hours one way. Add a few stops and it takes several more hours. Plan to spend the whole day, or longer, on your epic road trip journey through the Canadian Rockies. If the planets align and you are given the golden opportunity to drive this gorgeous stretch of road JUMP at the chance and go for it! You MUST drive the Icefields Parkway if you are planning a road trip anywhere near Alberta. Follow along with this Icefields Parkway itinerary to plan your stops on your Alberta road trip. 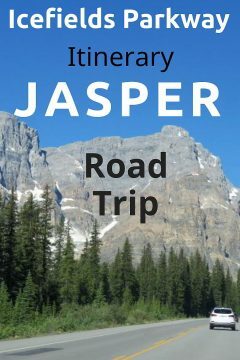 If you are doing a return trip back down the Icefields Parkway Hwy 93 from Jasper back to Lake Louise or Banff then you can pick half of these stops for your Banff to Jasper itinerary and half for the trip back to Banff. Another cool hike in Banff National Park is the Lake Agnes Tea house hike, put that one on your Banff bucket list too! Buckle up! 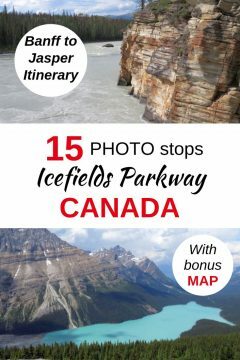 Let’s have a look at all the best photo stops and hikes on the Icefields Parkway from Banff National Park to Jasper. One more thing before we start out because it’s cool to know exactly where Icefields Parkway is actually located in Canada. Now I can tell you the highway is in between Banff and Jasper along the Rocky Mountains and near the border of the province of British Columbia. But it’s a whole lot easier if you can see the map of the Icefields Parkway itinerary so I made a Google map with all the stops on the way. Plus I added markers for Banff, Lake Louise, and Jasper. If the parking lot closest to the highway is full there is a big parking lot at Simpson’s Num-Ti-Jah Lodge right at the lake. Tour buses make regular stops here. Although they don’t stay long before they move on to the next stop on their Icefields Parkway tour on the way to Jasper or headed back to Lake Louise. IMPORTANT – Watch for Bow Summit sign and turn left or you will miss it! Driving from Jasper to Banff there is proper signage for Peyto Lake but not on the Banff to Jasper route. If you are headed north bound towards Jasper, take the Bow Summit exit on the left – this is the Peyto Lake exit. Don’t miss out! How do I choose which lakes to stop at? You have at least five lakes to choose from in the first 90 minutes of driving, yikes it’s too many and how am I supposed to decide which is the best lake to stop along the Icefields Parkway? Five lakes in a row is more lakes than I need to see in the first couple of hours on a one-day road trip. Plan to spend 15 minutes or more at each stop. If you hike Peyto Lake to the outlook add another hour. In a hurry, don’t have time, don’t feel like stopping every 20 minutes then choose just one beautiful glacial lake. But which ONE?! 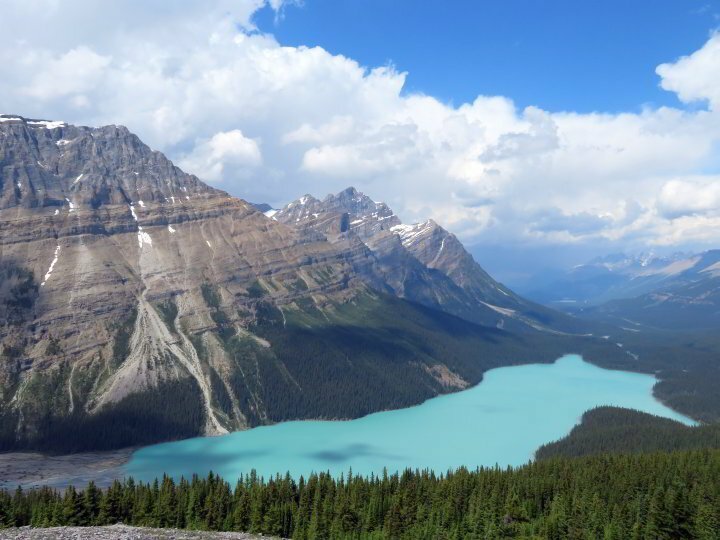 My pick is Peyto Lake if I could only make one stop on this stretch of the Icefields Parkway. If you can’t stand crowds, then either skip Peyto Lake or spend the extra time at Peyto to hike to the overlook that most tourists skip. Someone told me that 93% of tourists won’t go more than one km beyond where they stop at a sightseeing spot. Think about that for a moment. Good way to avoid the bus tour crowds is to go the extra mile… I mean kilometer! 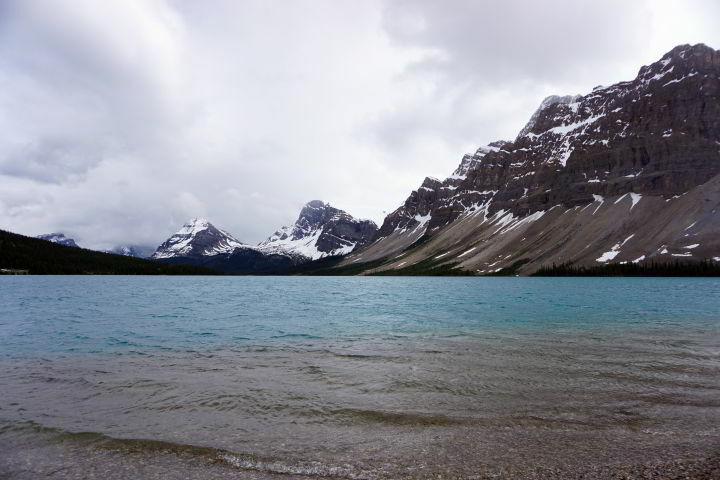 Easiest stop will be Waterfowl Lakes because it’s on the east side of the Icefields Parkway. That alone will save you time and the hassle of getting past cross traffic into and out of the parking areas on the west side of the parkway. If you drive back to Banff via Hwy 93 you can pick a few stops for that trip too. That way you can easily stop at all of the top photo stops along this top rated scenic drive. Mistaya Canyon is a short easy hike with a waterfall. Mind you I haven’t done this hike but it’s only 2.25 km (1.5 miles) total on an out and back trail with 57 m (187 ft) elevation gain. 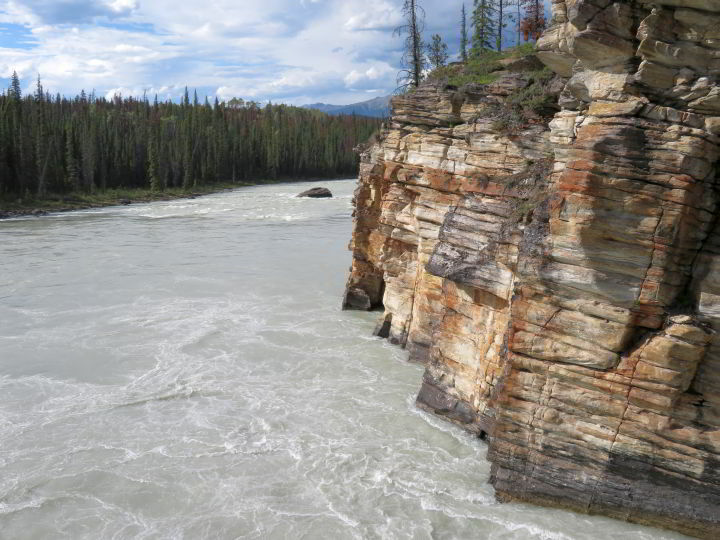 Easy peasy with extraordinary views of the canyon so this one is on my bucket list for next trip to Jasper. When my sister and I took a weekend getaway in the Rockies, Parker Ridge is where we stopped on the way to Jasper to hike the trail for an amazing panoramic view of a glacier. Even if you aren’t much into hiking you can enjoy this little trek in the Rockies. 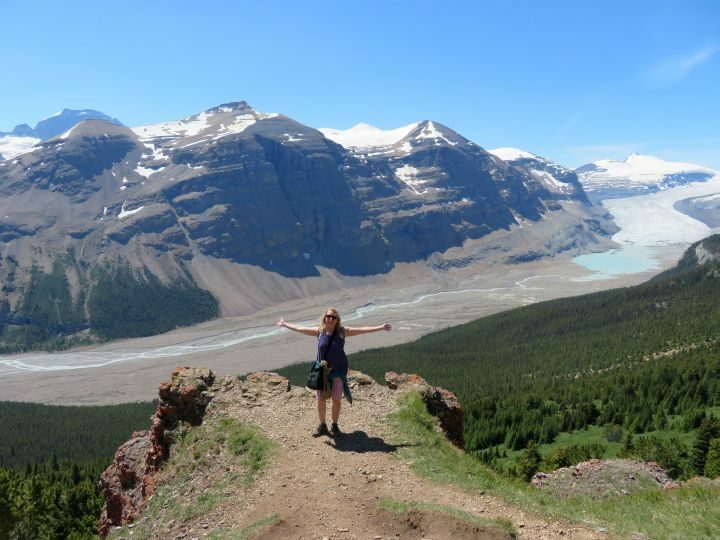 The thing is you don’t have to hike the whole trail to see the outrageously gorgeous view of the Saskatchewan Glacier. This is an easy hike and highly recommended for the stunning landscape. Although I haven’t hiked this beauty yet it’s on my list for my next road trip from Calgary to Jasper. It’s only a few kilometers from Parker Ridge Trail. Time: Allow at least 3 hours to the pass and back. If you hike further up to Wilcox peak you’ll need about 5 – 6 hours. Hikers often report seeing bighorn sheep and mountain goats on this trail. There are a couple of red Muskoka chairs (or Adirondack) at the overlook with stunning panoramic views of the Athabasca Glacier in the Columbia Icefields. Looking forward to hiking this trail in 2019 and have a feeling it may become my new favorite Icefields Parkway hike. There is a big parking lot at the Discovery Centre where you can buy tickets for the Icewalks and Snocoach tour. Save 10% by booking in advance online here. Buses transport everyone to the other side of the highway for the Snocoach tours and icewalks on the Athabasca Glacier. Easy hike to a glacier?! Hell yeah! And it’s no charge to do the hike. Other FREE stuff here includes visiting the Discovery Centre where you can get info from Parks Canada and a free map of the area. 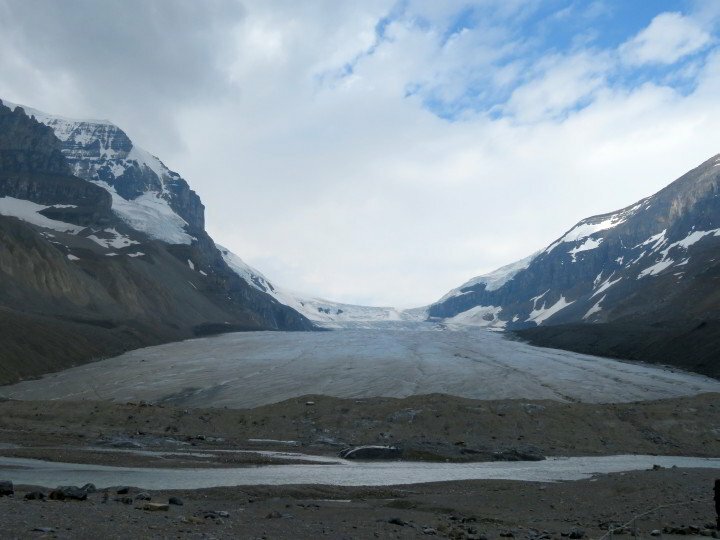 The hike to the Toe of the Athabasca Glacier is only 1.4 km (a little less than 1 mile) so give it a go! Today’s Athabasca Glacier is half it’s size from 125 years ago. Currently the glacier recedes approximately 5 m (16.5 ft) per year. 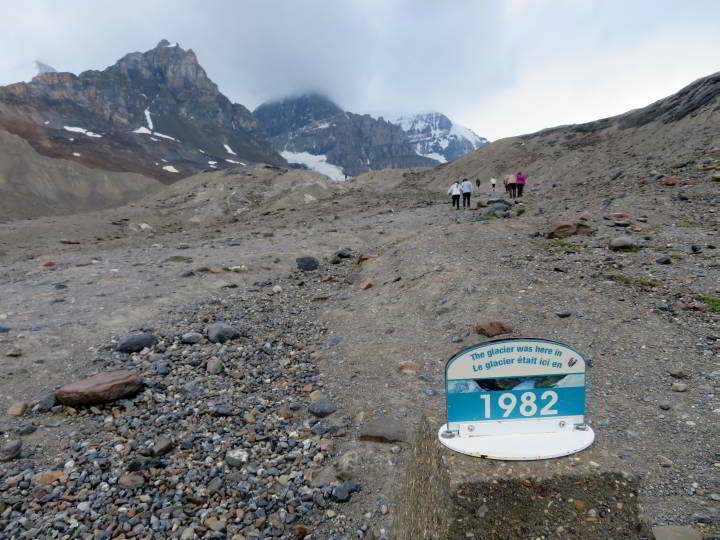 You’ll notice year markers along the hiking pathway indicating where the Athabasca Glacier used to reach at that time. 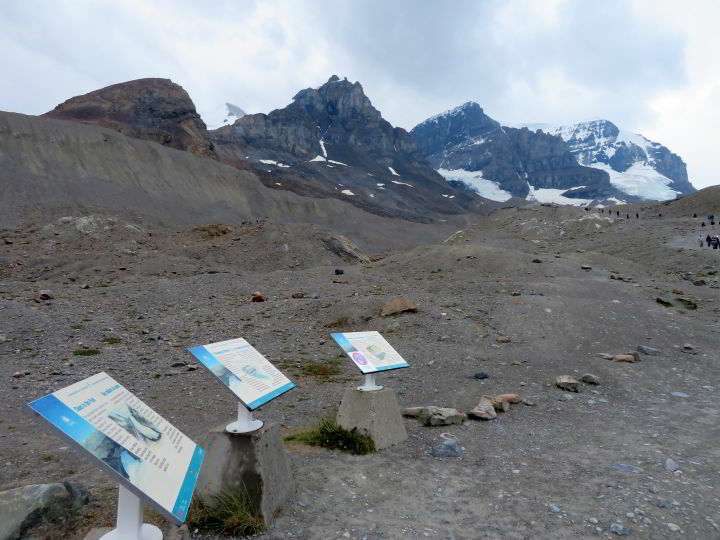 A stark reminder that nothing is forever and another reason to visit the Columbia Icefields now, while there’s still glaciers in the Canadian Rockies. This is a short easy hike to the base of the Athabasca Glacier, or the toe as they call it. 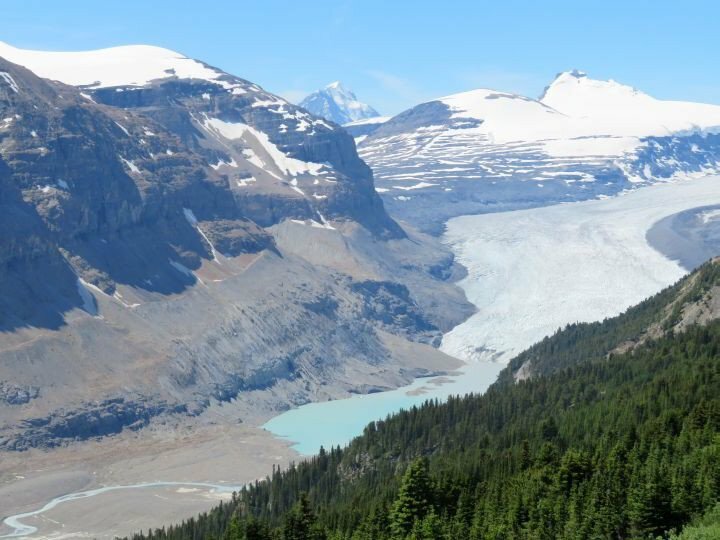 There are six major glaciers making up the Columbia Icefield in the Rockies and Athabasca is the most visited. The parking lot for the Toe of the Athabasca Glacier hike is a dirt parking lot across from the Discovery Centre. You access the trailhead from the parking area, walk across a small foot bridge and up a fairly steep incline to the base of the glacier. During the hike you’ll see a few info boards along the trail. Most importantly if you have children with you please do pay attention to where they are at all times. And do not let them roam outside of the specified trail area or beyond the rope marking the end of the trail. Toe of the Athabasca Glacier hike is open year round and it is free of charge. Walk on a glass observation platform overlooking Sunwapta Valley in the Columbia Icefields of Alberta. If you purchase tickets in advance you get a discount of 10% off regular rates. Check hours and rates for Glacier Skywalk here. While on our Jasper getaway my sister and I thought we would do the skywalk on the way back to Calgary. Unfortunately it was closed due to a thunder and lightning storm. Although could have waited it out we opted instead to drive on to Peyto Lake for a hike. Tickets for the Skywalk and Columbia Icefields Snocoach are expensive. Skip the Snocoach walk on a glacier and the Skywalk view of glaciers if you are on a budget. Similarly if you don’t feel like blowing around $100 to be surrounded by a bunch of tourists. While some people say it’s worth the dough, others say it’s too much money for the experience. To each their own. You decide what is right for you and your budget. Do what makes you happy. 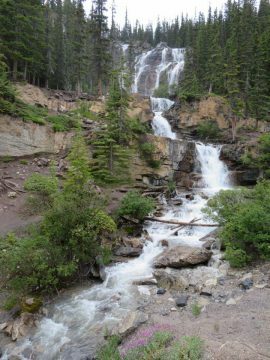 Tangle Falls is an easy stop on the Icefields Parkway because the falls are right there by the highway. In fact you can get a quick glimpse of the falls on the right-hand side of the highway even if you don’t stop. Waterfalls have a great vibe. Always a good choice to take a moment to gaze at a waterfall and let nature pour magical therapeutic good vibes your way. 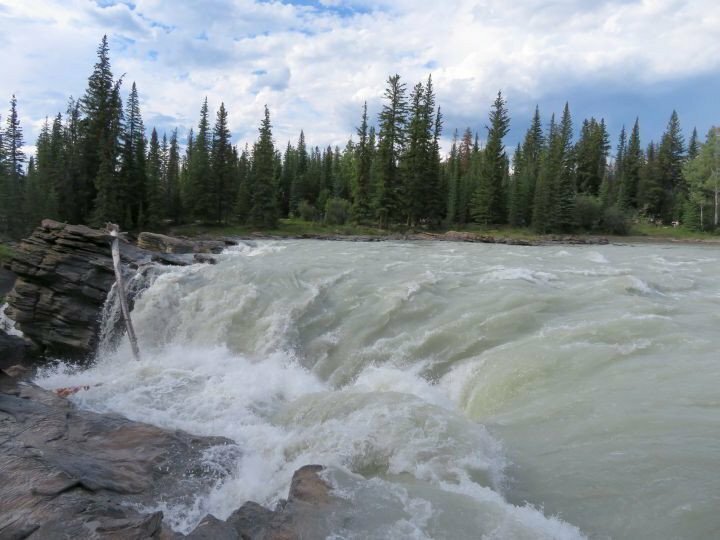 After Athabasca Falls you’re only about 30 minutes drive from Jasper but you could make one more stop if you have the energy to do a quick hike called Valley of the Five Lakes. It’s only 10 km (6 miles) south of downtown Jasper. So you could do the hike on the way to town, add if to your Jasper itinerary, or save it for your trip back on the parkway. With 15 outstanding photo op stops how can you decide on the best places to stop on the Icefields Parkway drive? Let me help you out with the top five picks from this Rocky Mountain road trip itinerary. 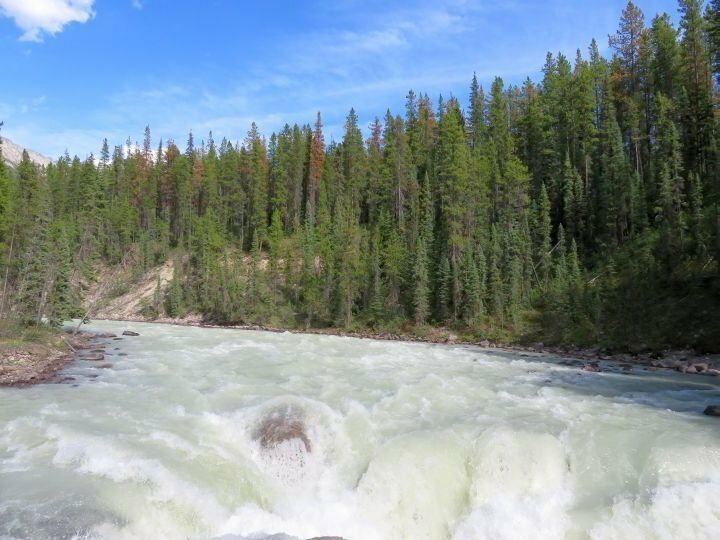 This Icefields Parkway road trip itinerary of the top 5 picks gives you a taste of the exquisite turquoise glacial lakes, waterfalls, and a couple of hikes with spectacular panoramic views in the Canadian Rockies. There you have it! Your Canada road trip itinerary should include this world famous scenic drive in the beautiful Canadian Rockies of Alberta. Put the Icefields Parkway on your bucket list and start planning the road trip of a lifetime today! 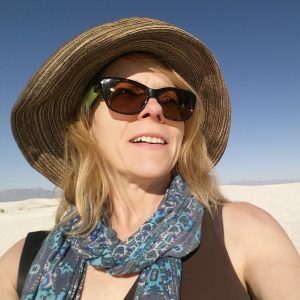 « Visit Yellowstone National Park – 5 Big Reasons You Must Go!